MANILA, Philippines – NAPOLCOM EXAM RESULT. The National Police Commission names 4,404 out of 30,231 (14.57%) passers of Philippine National Police (PNP) entrance exam, conducted on Sunday, April 22, 2018 in several testing centers nationwide. The NAPOLCOM exam result was released on July 12, 2018 or in three (3) months after the exams. NAPOLCOM Vice-Chairman and Executive Officer Atty. Rogelio T. Casurao said that a total of 2,977 of the 31,385 (9.49%) examinees for the PNP entrance test came from the National Capital Region (NCR) testing centers, namely, Makati High School, Pitogo High School, Benigno Aquino High School, Fort Bonifacio High School 1 and 2 and Tibagan High School, all in Makati City. 18-04-1109807, BICO, RHEA ANTHONETTE MOBESA. 18-04-0507949, BORAL, JOHN PATRICK . 18-04-0509540, BRINGINO, SALVADOR NICOLAS . 18-04-1108915, DADIVAS, JAMES PAUL . 18-04-0207610, EBINA, MAELA MARIZ . 18-04-0509370, FORMALEJO, MARY ROSE . 18-04-0408968, GAMILO, VERONICA RAQUEL . 18-04-1609362, GOMEZ, VINA ROSE . 18-04-4207938, ILANO, IRHONN JAN LEINARD . 18-04-0707657, JARDENICO, ALLEN MAR N/A. 18-04-1207517, LIBRANDO, CYRIAM LEE . 18-04-1609474, LIM, MARIELLE ARIANNA . 18-04-1610294, LLANERA, JACK LAURENCE . 18-04-1208337, MARIANO, HANNAH VANESSA . 18-04-1107704, PALMA GIL, ANNE . 18-04-0408617, PASTOR, MARK LAWRENCE . 18-04-1608550, ROSALES, AL GERON . 18-04-1608609, SANTOS, BRENT JUSTIN . 18-04-1308227, TREMBLAY, KARYL GENE . 18-04-1007555, VALLEDOR, TRIXIA MARIE . 18-04-1109357, VELASCO, QUEENIE ANNE . "The PNP entrance examination consists of questions on general information, verbal reasoning, quantitative reasoning and logical reasoning," Casurao added. Aside from the PNP Entrance exam, NAPOLCOM also conducted promotional tests for 15,191 hopefuls. The promotional examinations cover Police Officers 2 and 3; Senior Police Officer (for SPO1 to SPO4); Police Inspector (for Inspector and Senior Inspector); and Police Superintendent (for Chief Inspector and Superintendent). 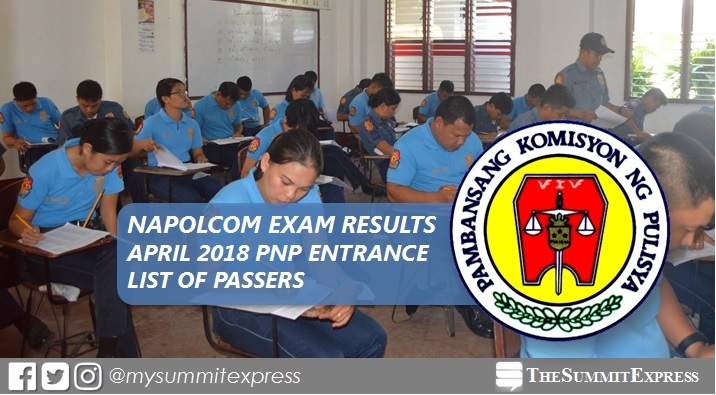 In April 2017 NAPOLCOM exams, results were announced online after three (3) months. A total of 2,026 or 7.63% out of the 26,561 examinees passed the PNP Entrance exam. Meanwhile, 5,610 out of 15,763 (35.59%) successfully hurdled the promotional examinations. The results of the October 2017 exams, meanwhile, were announced within 3-4 months, with partial results on January 15 and full list of passers on January 29. NAPOLCOM named 5,236 out of 28,654 (18.27%) passers of the PNP Entrance Exam while 5,391 out of 13,494 (39.95%) for the promotional level. Same with previous exams, the list of successful examinees will be posted at the NAPOLCOM central office located at the DILG-NAPOLCOM Center, NAPOLCOM Bldg., Edsa Corner Quezon Avenue, West Triangle, Quezon City, and can be viewed at the NAPOLCOM website at www.napolcom.gov.ph.